Rarely does a home come along that truly surprises; a dwelling that not only manages to fill its brief in terms of living requirements, but instils a sense of style, sophistication and elegance. Today on homify we are taking a peek inside one such dwelling. 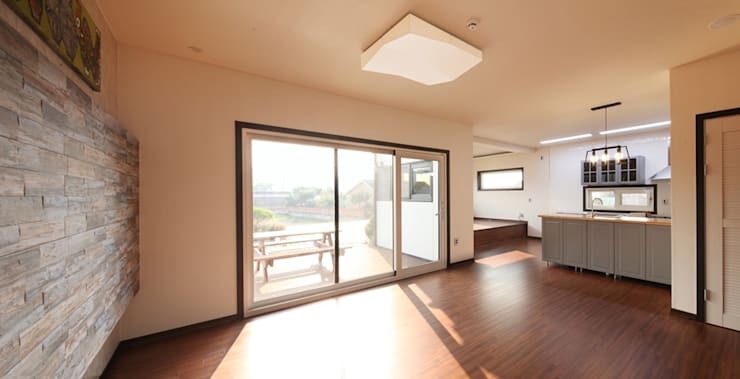 Nicknamed the ‘modern bungalow’ this residence caters for a South Korean client who wanted a minimalist abode replete with all the necessary amenities required for luxurious 21st-century living. 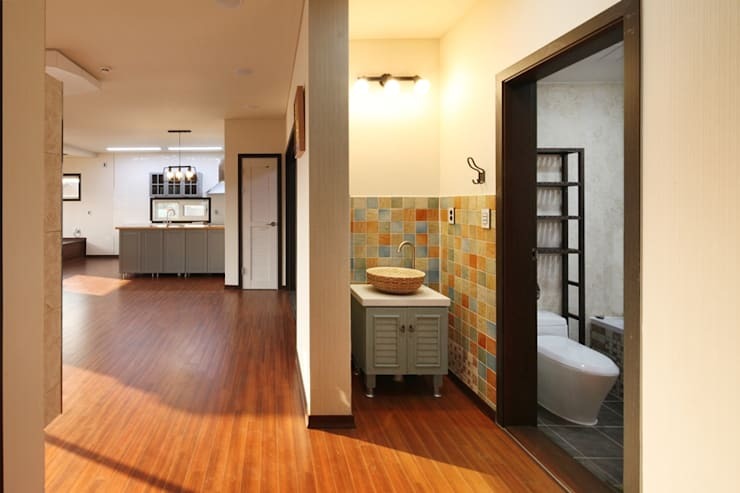 Seeking professionals to deliver on this rather challenging yet exciting brief, the owner enlisted the help of architects at Yunsung Housing. The result is a single-storey dwelling that boasts over 120 square metres of living space, encompassing a warm yet sleek interior finish throughout. Attention to detail was paramount to the success of the project, and employed high quality fixtures and fittings to all indoor and outdoor spaces. 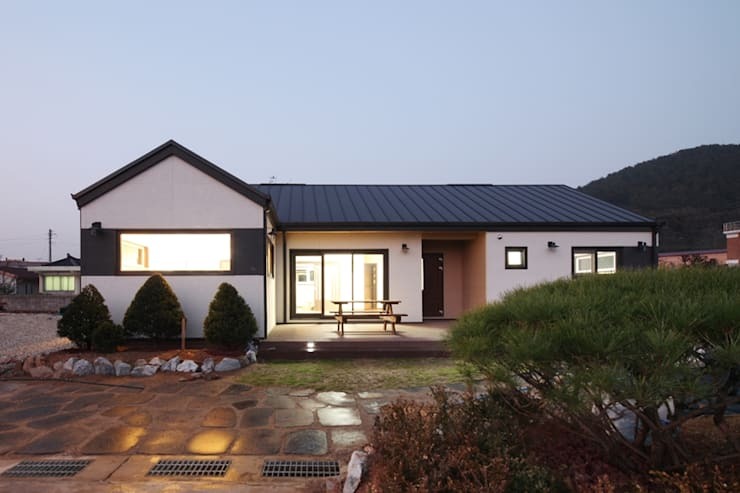 An impressive take on contemporary Korean design, the home is an impressive testament to exciting modern design and one’s ability to create a functional yet surprising residence. Sitting curbside we are instantly given a glimpse of this rather intriguing home. Not particularly remarkable from the exterior, it takes a few extra glances to spot some original and highly unique features within this property. The white and charcoal colour scheme is almost yin meets yang in its contrasting appeal, which adds to the originality and balance of the dwelling. One of the most eye-catching features is the outdoor seating that is reached from the parallel sliding glass doors. This entertaining area is ideal for family life, and helps create a sense of warmth and hospitality as one approaches. The garden is neat, tidy, with dark green conifers trimmed to perfection against the white façade of the house. As we enter one of the main reception rooms within this dwelling, the first surprise reveals itself. Hidden in the ceiling space of this bungalow is an additional floor with plenty of storage and living space as we will see further down. The interior walls are replete with an off-white/antique-white paint, while feature spaces boast stone cladding that adds to the overall luxury and chic ambience. 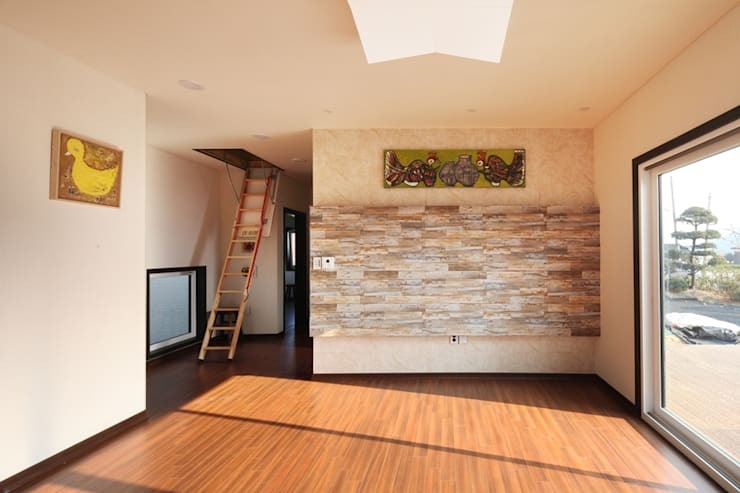 With enough room for wall art, this room is guaranteed to act as the statement making space within this home! One of the nicest elements in this modern home is the way the architects have combined contemporary elements with more traditional features and finishes. This example is a beautiful demonstration of that with the split interior space offering a juxtaposition of design and style. The brightly coloured tiles work beautifully against the warm honey-hued timber floorboards, and effortlessly contribute a sense of style when paired with the heritage sink and basin. 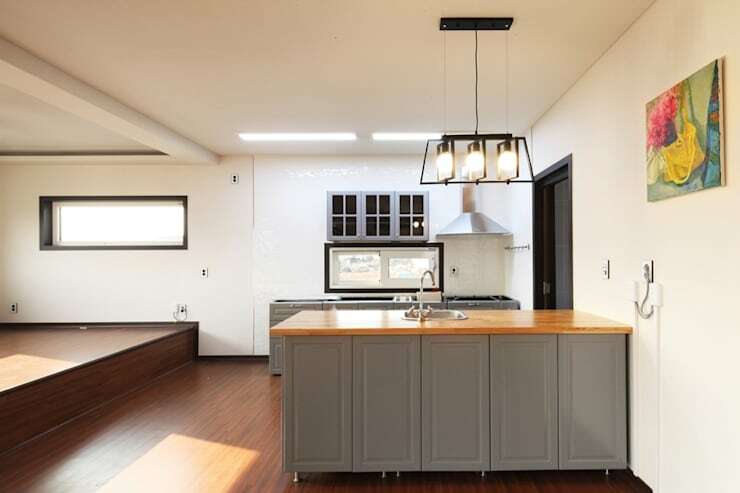 To the left of the room we see the contemporary kitchen joinery, which imparts modernity and class within the home. The styles in this dwelling are surprisingly successful, and evoke timeless refinement. Contemporary in its appeal, but timeless in its design, this kitchen boasts the best of two different styles that have been seamlessly paired together. The industrial light fitting sits over the sink, while the chic grey colour scheme of the bespoke joinery looks charming yet minimal. The design of the kitchen has been thoughtfully considered to exploit the shape of the room, and ensure those within the space are able to make the most of the open plan living areas, while still cooking in a functional and practical kitchen. As we take a peek of this room from another angle we see the sliding glazed doors that allow copious streams of light into the space. The stone wall can also be seen, while the outdoor living area can be pictured in its well-positioned location close to the kitchen and lounge. Where did that ladder lead? In one of the aforementioned images we were given a glimpse of a smallish ladder that appeared to lead into a hidden room. 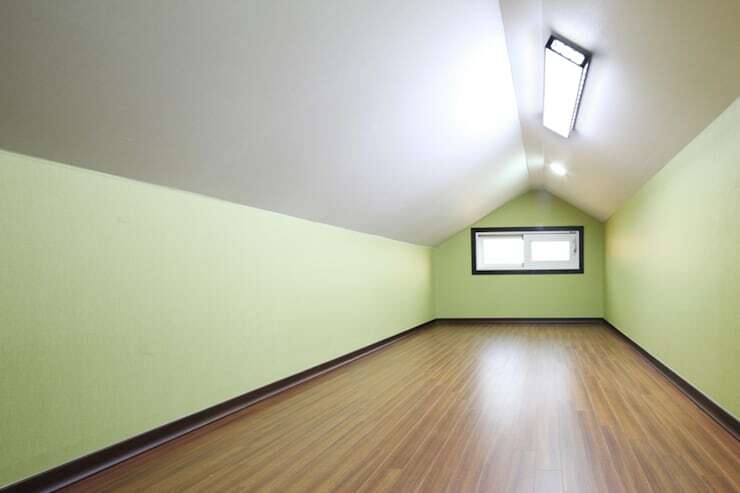 Instead of it leading to a dank and dreary attic space, the result is actually a room far more interesting. Loft-style in its appearance, this room is a stylish and gorgeously minimal area that could provide numerous living solutions. Whether you want a luxury master bedroom, a music room, or an art studio, the options are endless. The brilliant thing about this room is its size. Constructed over the top of the bungalow within the roof, the area has made the most of an awkward and oft-neglected domestic space. As we near the end of our tour we travel back outdoors to check out the landscaping around the exterior of the property. 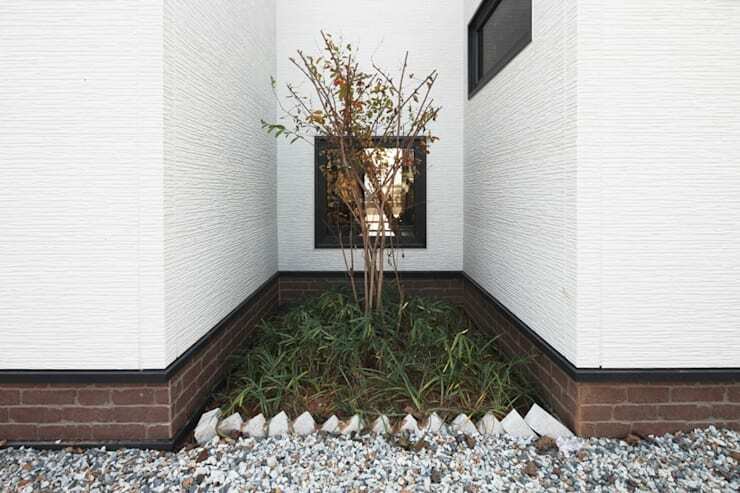 Zooming in on one particular feature, this stylish nook includes long grasses and a deciduous tree. During the warmer months this tree will shield the interior spaces from the sun, but during the cooler weather provide a gorgeous outlook for those within the house, as well as letting in copious volumes of light. Around the side of the dwelling we are given one last look at the shape and structure of the modern bungalow. The house’s white colour scheme is impressive, and works gorgeously against the striking landscape beyond. The residence features strong design lines and architectural features, cementing it as one of the most exciting and surprising homes we have seen. Inspired by this delightful dwelling? Then check out another fabulous home here: The Hidden Beauty House. What do you think of this intriguing property? Let us know by leaving a comment below!